The daylilies just don’t seem to stop. I didn’t realize how many daylilies I have added to my garden in the last three years until I started taking photos of them as they opened. I wish I would have started with these lovelies years earlier. This is one is I received from my sister who in turn got it from my mother. I just love having plants from relatives and friends. Every time I see one of those plants, I think about the generous gardener who shared their plants with me. Here are some others that have bloomed recently. 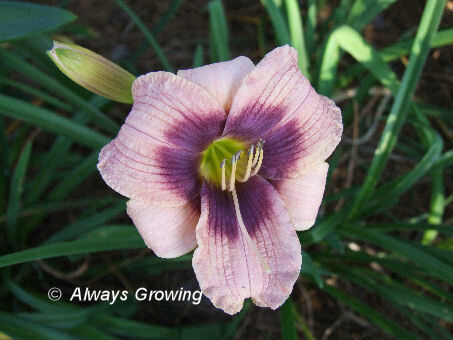 I think this next one is the first daylily I ever bought. It is called Plum Tree and is a terrific bloomer. The flowers are on the small side, but the quantity of blooms makes up for the size. All of my red daylilies are in the garden bed around our front entry. This is only the second year that I have had any red daylilies, but I can’t wait to add more. 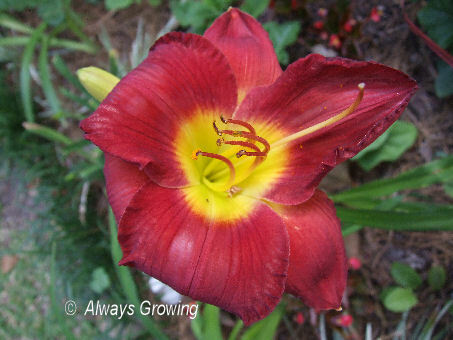 This is one I bought in 2010, and it was just labled “Daylily, Red”. It is too pretty to have such a plain name. 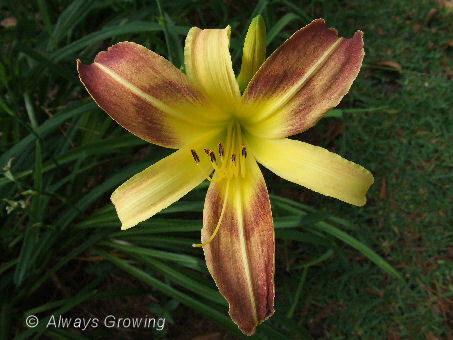 Finally, one of my newest daylilies, a miniature one called Pocket Change. I purchased this one at the New Orleans Garden show in April, and even though they were bare root, all four of the plants bloomed. These are planted in the very front of the garden bed since the flowers are small and the stems are short. Just a few more daylilies left to post, but that posting will have to wait for another day since working in the garden today has left me so tired tonight. 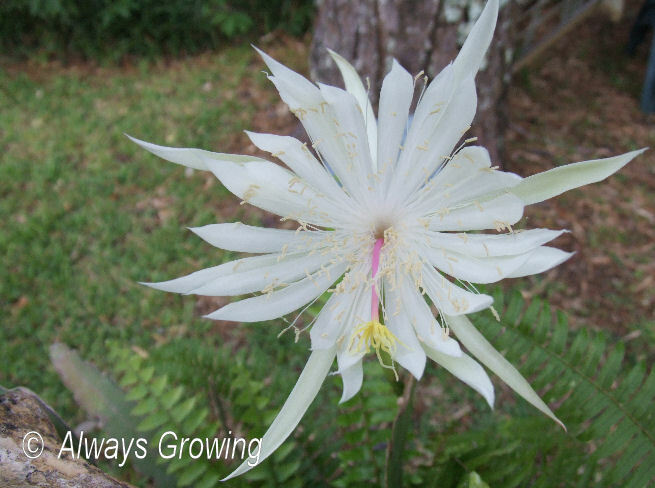 It is a good thing the night blooming cereus doesn’t require a lot of water. As I have mentioned before, we are in the midst of a serious drought. Today, we missed two showers. When the sky darkens, the temperatures drop, and the wind picks up, it is so discouraging not to get any rain. I keep saying to myself that we will get rain eventually. But, back to the cereus. This lovely plant has started blooming, and I have been up early enough in the morning to see a flower. Here in south Louisiana, my plant stays outside year round. It is in a container and in the winter I just put it in a protected area and cover it only if a freeze is predicted. So far all of mine have come through the winter okay. 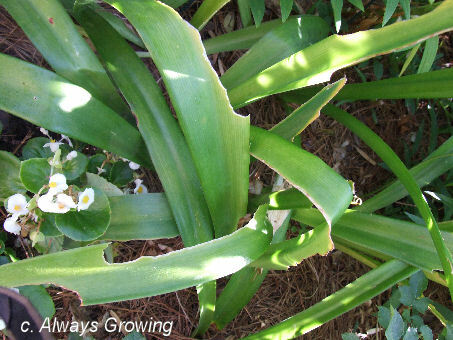 This is such an easy plant to take care of – a little sun and a little water is all that is needed. 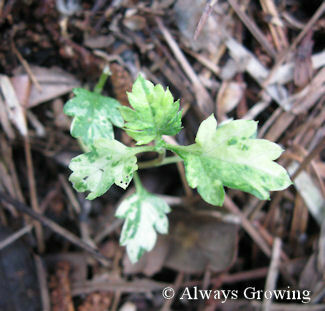 It is also easy to propagate – just stick a piece into the ground and you have a plant. I love that it blooms only at night. 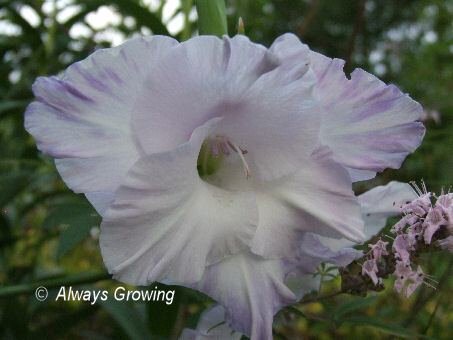 During the summer it is nice to stay up late, go outside and see this large white flower. Kind of makes up for not getting any rain. 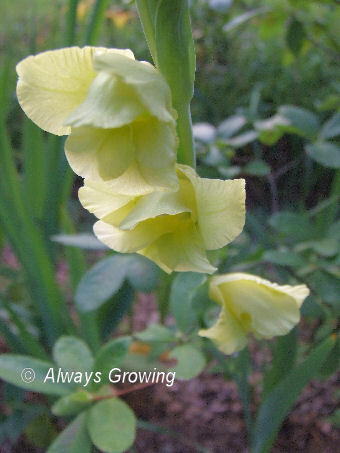 The gladiolus that I have had in the garden for a few years are all doing well this year. 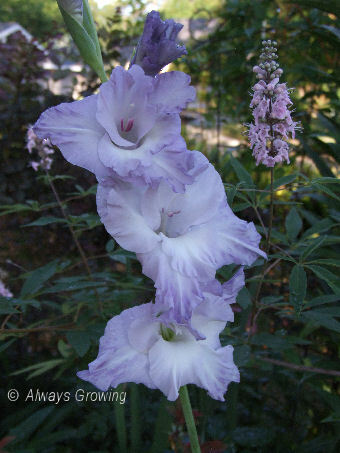 One of the first gladiolus that I planted was supposed to be Harmony, a pink variety, but they turned out to be a light lavender. I was still happy with the color, but the flowers didn’t bloom right. After a little investigation, I figured out the flowers were probably damaged by thrips. The next year, I planted Friendship gladiolus and they were fine, but last year these flowers too were damaged just like the lavender. This year, I sprayed the plants with sevin and that certainly solved the problem. I really do not like to use any kind of poison in my garden, but only one light spray when the flower buds first appeared was all that was needed to get rid of the problem. Finally, there were beautiful blooms. Now both of these lovely gladiolus are looking their best. Another glad that has never had any problems with thrips is a yellow one that is in another area of the garden. This is a smaller flowered one that blooms after the pink and lavender ones. 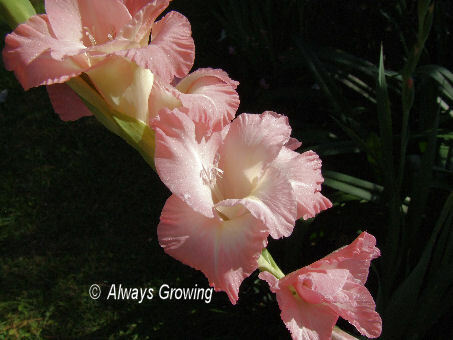 Even with the high heat we have been having around here, all the gladiolus are finally gorgeous. Finally, we have had some rain though it was only .75 inches. However, the cloudy weather for the last three days have kept the temperatures down which I know has helped the plants in the garden. Day after day of dry weather and temperatures in the high 90’s is hard on even the most drought tolerant plants. Catching up with what has been in the garden brings us to lilies which did very well this year. I have not had lilies in the garden very long, but I certainly do like them. Since these have done so well, I am considering adding more. 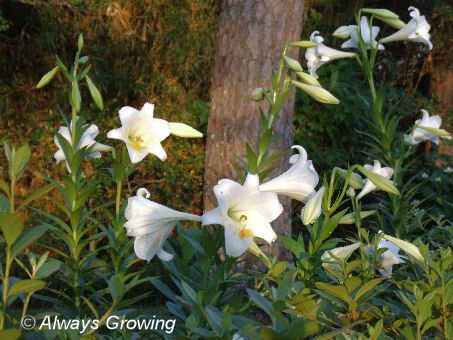 The first ones I ever planted were Lilium longiforum or the traditional Easter lily. 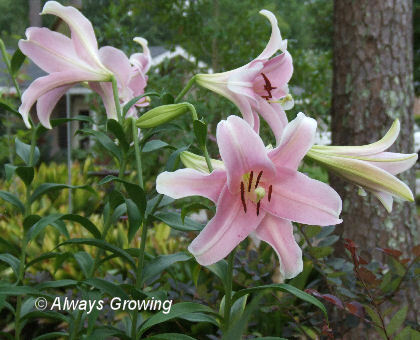 These do very well here in South Louisiana, in fact, they used to be grown here for the Easter lily trade prior to WWII. The second lily in the garden is Triumphator. I started with this lily as a lucky accident and was so happy with the first blooms that I just had to get more. 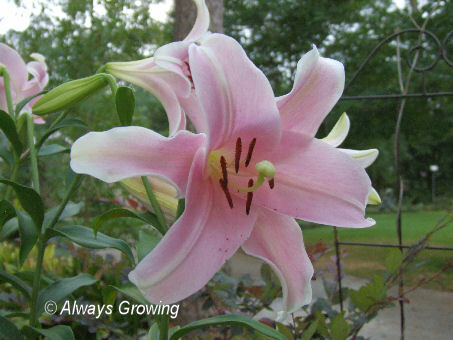 Finally, the last lily to be planted in the garden and the last to bloom is a solid pink one. 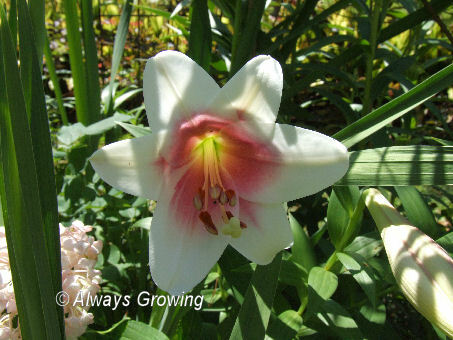 It was purchased as Lilium longiforum Pink Heaven, but I am not so sure that is what this lily is as it does not quite look like other photographs I have seen of this variety. However, if it is or isn’t Pink Heaven, it still is a very lovely flower. 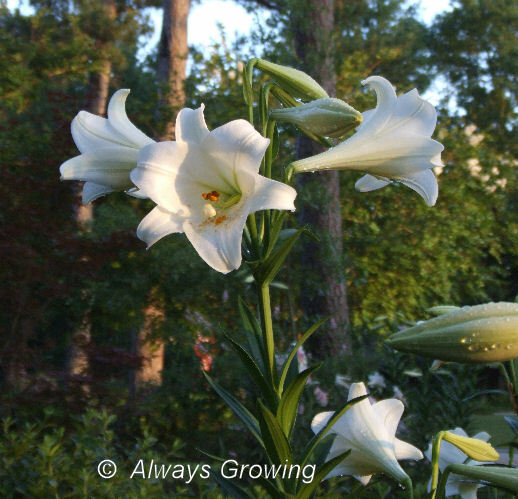 I hesitated adding any lilies but the Easter lilies to my garden because I had heard that lilies do not do well this far south with our heat and humidity. Success with these makes me think there are others that may like this area. 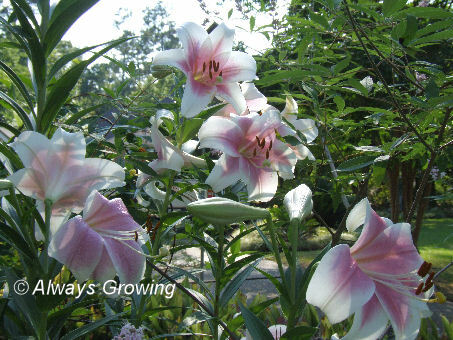 Lilies certainly add to the late spring/early summer garden, and I am glad I planted them. About this time last year, I wrote about two battles I was fighting in the garden, and I thought I would give an update. One of the struggles concerned the eradication of Limelight artemisia. This lovely plant turned into an invasive enemy, and I am happy to report complete success in eliminating it from my garden. I struggled with this plant for about three years until I made a concerted effort last year to get rid of it completely. I pulled out every tiny plant I saw, and this spring there were only a handful of returnees that were easily removed. Ahhh, success. On the second battle front, I have not been successful. This concerns the grasshoppers, specifically the Eastern lubber. I saw the first ones four years ago, and each year has brought more and more. The reason I hate these grasshoppers so much is that they eat my amaryllis bulbs and leaves. Because this area has mild winters, we can grow amaryllis in the ground, and I have planted a great many. This past spring, there were fewer flowers, and I attribute this to the grasshoppers eating the leaves during the summer which probably prevents flower formation. The photo below shows some damaged leaves in May; it is now worse. I don’t like to use chemicals in my garden, and there is really no effective chemical solution to these eating machines, so the “stomp” method is what is recommended. Each year there has been more and more of these grasshoppers, and last year seemed the worse. This year there are a great many, but it doesn’t seem as if there are as numerous as last year. By the middle of June, they are fairly large with voracious appetites. Yesterday, I found one eating the bulb of an amaryllis I purchased last fall and hadn’t planted in the garden. You can see what I am up against. This bulb was fine the day before. 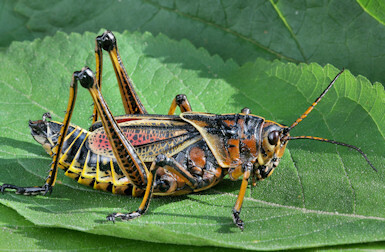 While there does seem to be a smaller number of grasshoppers this year, I have decided that if the damage gets much worse, I am going to dig up all the amaryllis and plant them in very large containers and place these in the garden. That way, I can cover them with netting next summer to try and protect them from being eaten. 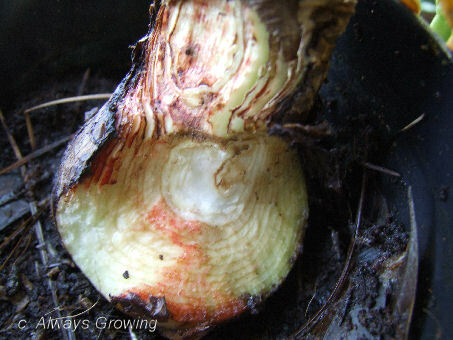 In fact, the white amaryllis leaves already have been eaten so badly, that I am thinking I will dig them up this summer and place them in a container. After having won the Limelight artemisia battle, I am not going to surrender to the grasshoppers. It will take me a few posts to catch up with what has or had been happening in my garden. This drought we are experiencing has finally entered the bad phase. So far we have had no rain in June, only 0.67 inches in May and only 0.64 inches in April. In a normal year, these three months average about 16 inches of rain, and all we received is 1.31 inches. With high temperatures in the mid to high 90’s, you understand that I mostly spend my time watering and trying to keep plants alive. Even with the drought, the daylilies have continued to bloom. One that I am sorry I did not buy more of is Little Wart. 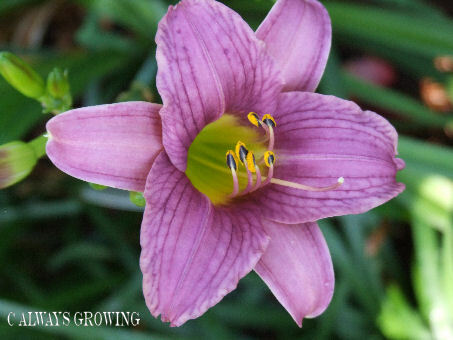 This is a precious, small daylily that deserves a better name. 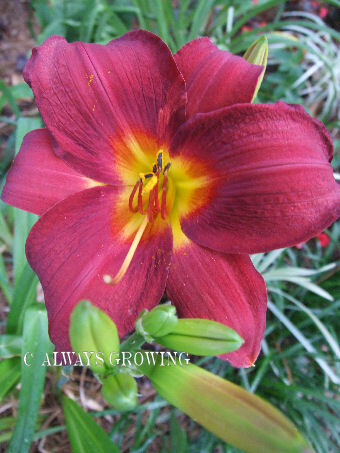 The red daylilies that have only been in my garden for two years or less are doing very well. The first one I planted is always the first to bloom. 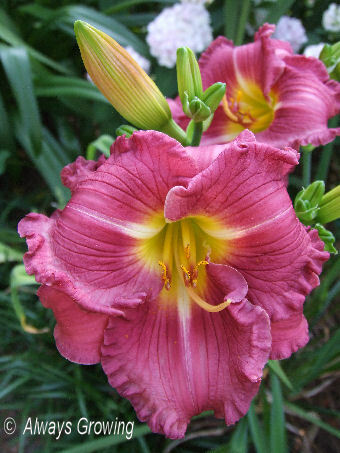 One of my oldest daylilies is Rose Passion. 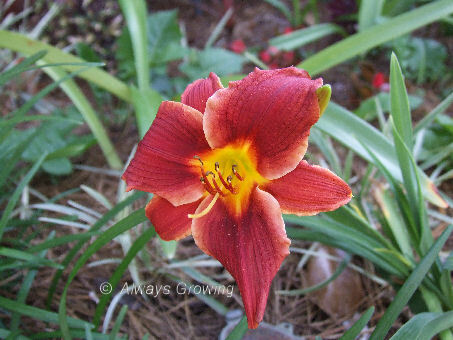 This is another small daylily that I have placed at the front of the border. 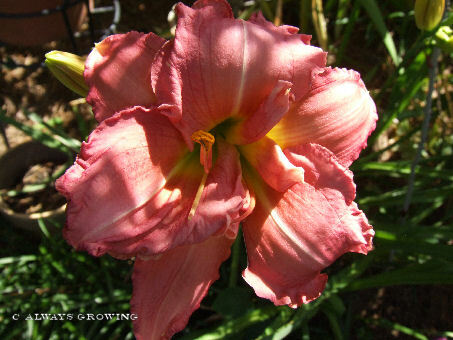 One of the big, frilly daylilies that is a recent addition from last year, certainly put on a show this year. This is one of the most prolific in my garden. I didn’t realize how many daylilies I have added to the garden in the last few years. There are still a few more photos of other ones I will have to post. 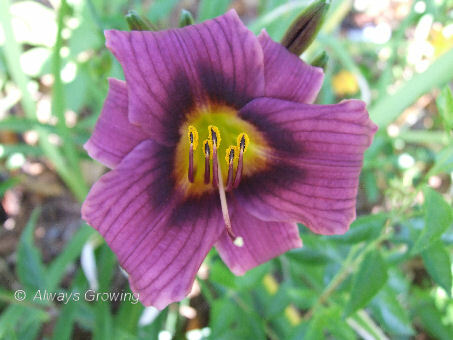 Since I have started planting just perennials, I have learned to appreciate the daylily. I look forward to their increasing in size so that I can divide them for a better showing. 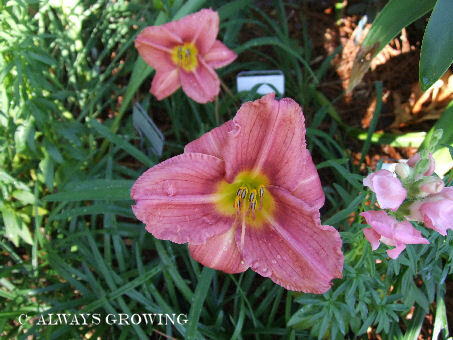 One mistake I made when first buying daylilies was that I bought only one plant of a particular variety. Now, I buy at least three of one variety so that there is a nice display of flowers of a single color. This just goes to show that you always have something to learn.